Development of products with Django framework is usually easy and straightforward; great documentation, many tools out of the box, plenty of open source libraries and big community. Django ORM takes full control about SQL layer protecting you from mistakes, and underlying details of queries so you can spend more time on designing and building your application structure in Python code. However, sometimes such behavior may hurt - for example, when you’re building a project related to data analysis. Building advanced queries with Django is not very easy; it’s hard to read (in Python) and hard to understand what’s going on in SQL-level without logging or printing generated SQL queries somewhere. Moreover, such queries could not be efficient enough, so this will hit you back when you load more data into DB to play with. In one moment, you can find yourself doing too much raw SQL through Django cursor, and this is the moment when you should do a break and take a look on another interesting tool, which is placed right between ORM layer and the layer of raw SQL queries. As you can see from the title of the article, we successfully mixed Django ORM and SQLAlchemy Core together, and we’re very satisfied with results. We built an application which helps to analyze data produced by EMR systems by aggregating data into charts and tables, scoring by throughput/efficiency/staff cost, and highlighting outliers which allows to optimize business processes for clinics and save money. What is the point of mixing Django ORM with SQLAlchemy? For ORM world, one object is one record in the database, but here we deal only with aggregated data. Some aggregations are very tricky, and Django ORM functionality is not enough to fulfill the needs. To be honest, sometimes in some simple cases it’s hard (or even impossible) to make ORM produce the SQL query exactly the way you want, and when you’re dealing with a big data, it will affect performance a lot. If you’re building advanced queries via Django ORM, it’s hard to read and understand such queries in Python, and hard to predict which SQL query will be generated and treated to the database. It’s worth saying that we also set up a second database, which is handled by Django ORM to cover other web application related tasks and business-logic needs, which it perfectly does. Django ORM is evolving from version to version, giving more and more features. For example, in recent releases, a bunch of neat features were added like support of Subquery expressions or Window functions and many others, which you should definitely try before doing raw SQL or looking at the tools like SQLAlchemy if your problem is more complex than fixing a few queries. So that’s why we decided to take a look at SQLAlchemy. It consists of two parts - ORM and Core. SQLAlchemy ORM is similar to Django ORM, but at the same time, they differ. SQLAlchemy ORM uses a different concept, Data Mapper, compared to Django's Active Record approach. As far as you’re building projects on Django, you definitely should not switch ORM (if you don’t have very special reasons to do so), as you want to use Django REST framework, Django-admin, and other neat stuff which is tied to Django models. Note: with such tricks, we don’t fall into N+1 problem: from_select makes an additional SELECT wrapper around the query, so we reduce the amount of rows at first (via LIKE and LIMIT) and only then we join the address information. So if you’re interested and want to try to mix SQLAlchemy with Django application, here are some hints which could help you. First of all, you need to create a global variable with Engine, but the actual connection with DB will be established on first connect or execute call. Next step is to build your queries. Depending on your application architecture, you can declare tables and fields using Table and Column classes (which also can be used with ORM), or if your application already stores tables and columns names in another way, you can do it in place, via table (table_name) and column (col_name) functions (as shown here). In our app, we picked the second option, as we stored information about aggregations, formulas, and formatting in our own declarative syntax. Then we built a layer which read such structures and executed queries based on the provided instructions. When your query is ready, simply call sa_engine.execute(query). The cursor would be opened until you read all the data or if you close it explicitly. For dates, such a trick will not work. There is a discussion on StackOverflow on how to achieve the desired results, but solutions look unattractive. Another option is to enable queries logging into the file via database configuration, but in this case, you could face another issue; it becomes hard to find a query you want to debug if Django ORM connected to this database too. So what does it mean - not support? By default, Django will create and remove (at the end of all tests) a test-database for each db listed in DATABASES definition. This feature works perfectly with pytests also. Django TestCase and TransactionTestCase with multi_db=True enables erasing of data in multiple databases between tests. Also it enables data loading into second database via django-fixtures, but it’s much better to use model_mommy or factory_boy instead, which are not affected by this attribute. There are a few hacks suggested in pytest-django discussion how to work around the issue and enable multi_db to continue pytesting. There is one important advice - for tables that have Django-models, you should save data to DB via Django-ORM. Otherwise, you will face issues during writing tests. TestCase will not be able to rollback other transactions which happened outside from Django DB connection. If you have such a situation, you may use TransactionalTestCase with multi_db=True for tests which trigger functionality, which produces DB writes through SQLAlchemy connection, but remember that such tests are slower than regular TestCase. Also, another scenario is possible - you have Django-models only in one database and you’re working with the second database via SQLAlchemy. In this case, multi_db doesn’t affect you at all. In such cases, you need to write a pytest-fixture (or do it as a mixin and trigger logic in setUp if you’re using unittests) which will create DB structure from SQL file. Such a file should contain DROP TABLE IF EXISTS statements before CREATE TABLE. This fixture should be applied to each test case which manipulates with this database. Other fixture could load data into created tables. Note: Such tests will be slower as tables will be recreated for each test. Ideally, tables should be created once (declared as @pytest.fixture(scope='session', autouse=True)), and each transaction should rollback data for each test. It’s not easy to achieve because of different connections: Django & SQLAlchemy or different connections of SQLAlchemy connection-pool, e.g in your tests you start the transaction, fill DB with test data, then run test and rollback transaction (it wasn’t committed). But during the test, your application code may do queries to DB like connection.execute(query) which performed outside of transaction which created test data. So with default transaction isolation level, the application will not see any data, only empty tables. It’s possible to change transaction isolation level to READ UNCOMMITTED for SQLAlchemy connection, and everything will work as expected, but it’s definitely not a solution at all. To sum up everything above, SQLAlchemy Core is a great tool which brings you closer to SQL and gives you understanding and full control over the queries. 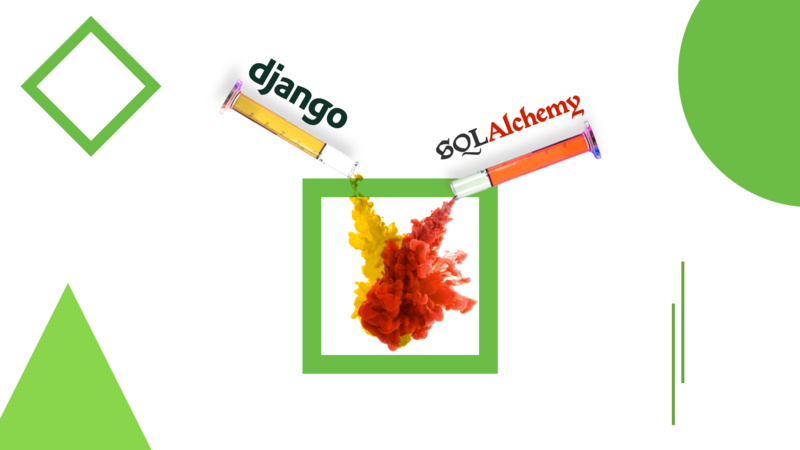 If you’re building the application (or a part of it) which requires advanced aggregations, it is worth it to check out SQLAlchemy Core capabilities as an alternative to Django ORM tools. Read on to learn how to make building advanced queries for data analysis projects easier. Find out how we managed to mix Django ORM and SQLAlchemy Core and what we got from it. The article is written by Gleb Pushkov. This tutorial on merging django orm is originally published on Django Stars blog. You can also visit our content platform Product Tribe created by professionals for those involved in a product development and growth processes.